The Regional Transportation Authority stepped in to prevent the county from spending RTA funds on a project it wasn't originally approved for. Learn more about what the county wanted to use the money for. 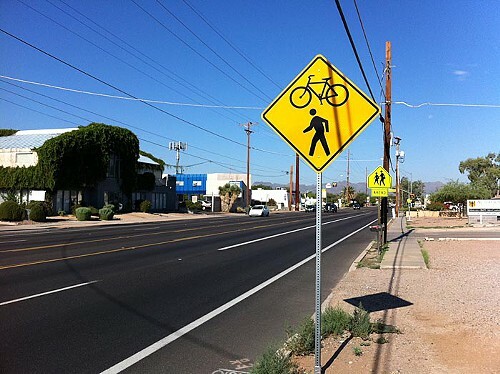 Signs along the roadway alert motorists to expect both bicycles and pedestrians in the crossing. The City of Tucson is attempting to legitimize bicycles use of pedestrian crossing signals. Check it out. Hundreds of cyclists turned out for a climate change ride last weekend. See more photos from the event. TriSports.com, a local bicycle business, is in the running for Arizona's Greenest Business Award. See why they are green and how you can help them win. BICAS won a $2,500 grant from GOOD Magazine and CLIF Bar. Find out what they are going to do with the money.